We are about six weeks into our laundry re-vamp, and things are going well. To be 100% honest, we have had some roadblocks. A traveling weekend here and an activity-filled weekend there forced the laundry job to fall on my shoulders for two consecutive weeks, since I am home eating bon-bons all day. Ha! But aside from that, the kids have pretty much taken over the laundry job. They handle the whole laundry, from start to finish? What do you do–pay them a million bucks? What I wouldn’t do to have this job shared by my family and not rest on my lap—I hate laundry. There’s no way my kids would do laundry. How do I even begin? After thinking about it, I realized that getting kids to do laundry isn’t top-secret material. It’s just a few things we’re doing to make laundry more enticing. More approachable. More kid-friendly. Like a lot of what we try over here, it’s about setting our kids up for success. Because really? Don’t we all want to do things well? And it’s also about consistency, follow-through, and support. Three things that are really, really hard for busy families. But we’re trying. The bottom line is that if our family can have kids doing laundry, any family can do it. 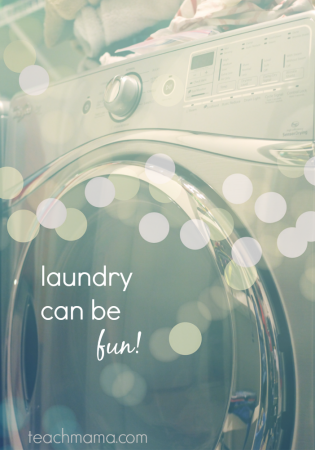 Kids Doing Laundry–3 Secrets to Success: Granted, like most of parenting, getting kids to do laundry–and like it!–is a work in progress. But for the most part, these are our three secrets to success. 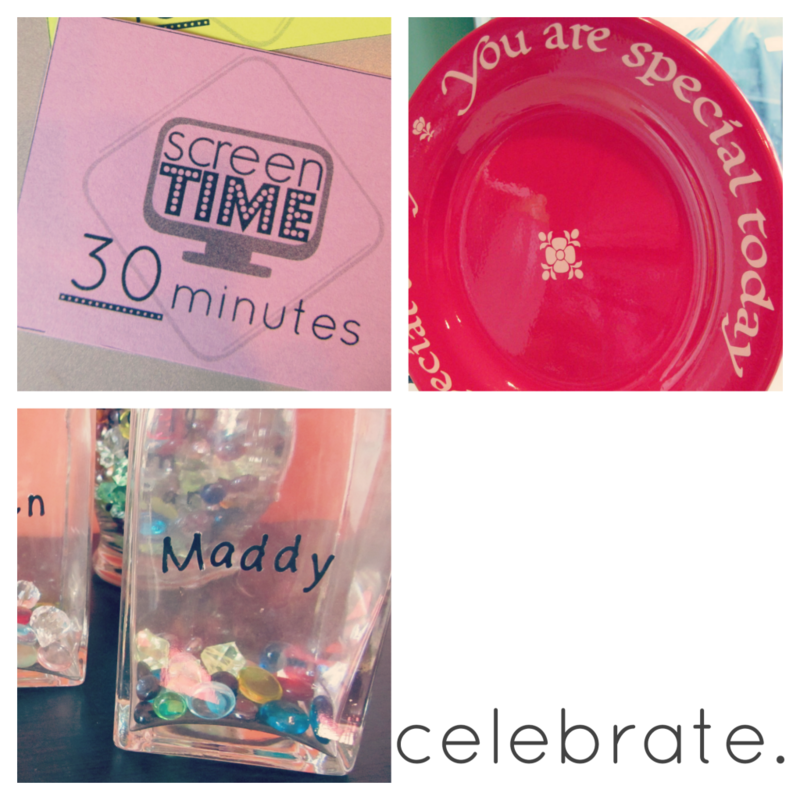 Give your kids specific, clear, manageable jobs. 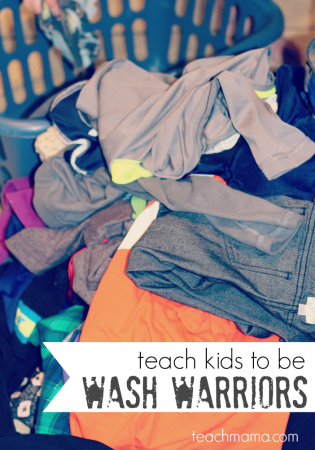 We have our Wash Warrior poster up on the wall in our laundry room so the kids can reference it at any time, and it helps. 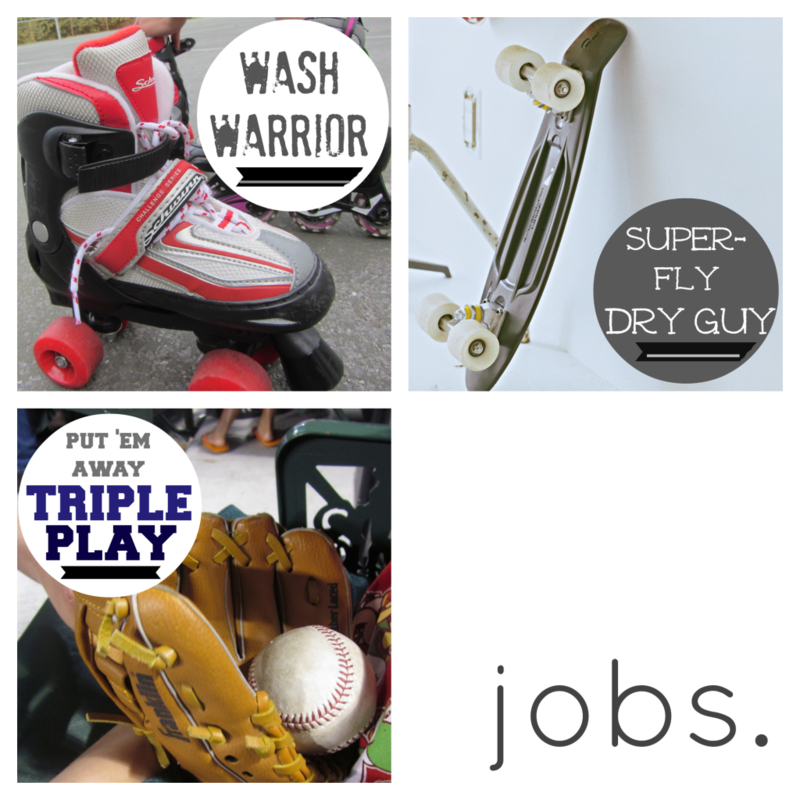 The Wash Warrior, Super-Fly Dry Guy, and Put ‘Em Away Triple Play jobs each have distinct components with step-by-step directions. That way, there’s no question. 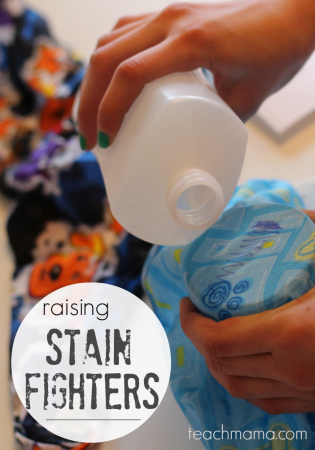 And if they hit a roadblock–a stain!– the Stain Fighter information is right there, too. Bottom line is that though the jobs are outlined and info right there, they know that they can call for help (me!) at any point in the process. We’ve made the laundry job light, fun, and not at all scary for them. Adding a bit o’ tech to the mix has helped make this job more kid-friendly as well. Whirlpool’s Wash Squad app seriously rocks. And it only takes a minute to learn. 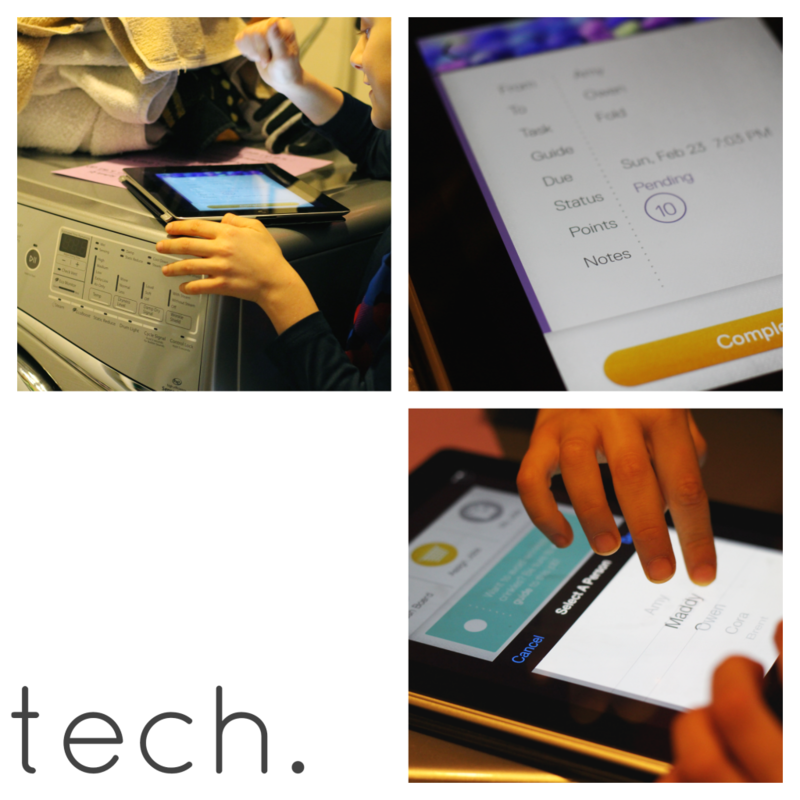 It allows kids to sign in, get their job assignments, and then earn points when they’ve finished their job. For some kids this might not work because they respond better to #2–the personal celebrations of success and an actual hug, high-five, or shout-out. But for other kids who thrive on earning points and who enjoy playing with numbers, and getting their handds on the iPad, this tech piece is huge. Again, it’s what works best for your family. Celebrate success if someone totally rocks one load from start to finish–solo–then we really make a big deal of it. Doing laundry isn’t the quickest job in the world, so it does take time and patience. And Maddy, Owen, and Cora are still little. They need to listen for the buzzers, be aware of the movement from washer to dryer and from dryer to basket and from basket to bedrooms. The Special Plate still works for our family, so occasionally someone who takes the lead on laundry may get the Special Plate for dinner.
. . . whatever works for your family. For my family, all three of these ideas work together as our ‘secret sauce’. Each of my kids are so different, that these three pieces seem to work for them all. And? Because kids are kids and every day is different, what works one day may not work the next. So having me consistently on the sidelines seems to help tremendously. It’s a win-win. Not only are the kids doing the laundry and helping our family, but they’re also learning a life skill. And maybe when they get to college, they’ll be the stars of their hall because they’ll know how to do laundry from start to finish and can save their pals’ shirts from nasty stains. We shall see! How does your family manage the laundry? Do the kids help? Run the show? Do tell! We would LOVE to know! fyi: This is a sponsored post, written as part of the Whirlpool Ambassador program. As always, opinions and ideas are my own, influenced only by my experience as an educator and parent and my three little wash warriors. Audrey, I would be insane if I had that much laundry. . . but you have a small army of helpers over there, so you are a wise mama to put them to work! And? These devices are incredible. Fast, efficient, and fun to use. Comprehensive overview! I used to tell my daughter she was practicing for her own apartment someday, which motivated her. She only had to do her own laundry, so we shared the washing machine and dryer. It worked. Carolyn, THANK YOU, friend! I love that you told your daughter that she was practicing for her own apartment–serious motivator!! I will add that to my ‘bag of tricks’ for when my kids need a little extra kick! That Wash Squad app looks neat. I may download it to motivate MYSELF to do the laundry. I am totally bookmarking this series to revisit this summer when my son will be old enough to handle this chore. Thank you for all of the great tips and links to cool resources! Amy – I LOVE everything about this. 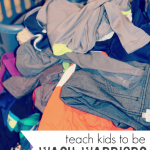 I think naturally laundry is often something we just tackle on our own, forgetting a) the skills we are teaching our children by getting them involved and b) the PEACE it adds to our lives to have the help. You did an AMAZING job detailing all of the ways this WORKS and beautifully. Thank you. Thanks, friend. Thanks so much. Let me know if you give it a go with your two little people! Super tips! I have a basket for each child and their clean clothes go in there, ready for *them* to put away. there you go, Cathy! Also a great idea!! You’ve inspired me! The dude isn’t too young to start sorting and help fold right? You got it! Yay!!! No–get him started asap, Kristin!! I need you in my life – like in my house. Not just online. This post was amazing!!! HA! Vera you make me laugh. I’m coming over. For dinner. And drinks. You are such an inspiring mama! Love this! I have a 7 yo and 9 yo doing their own laundry from beginning to end too. We just started this school year as I have felt overwhelmed working outside the home. I don’t do any of what you mention there, though. If I took the time to make all of that happen then this wouldn’t happen. So I just want to encourage anyone who doesn’t want to put that much effort into it, you can still be successful. Granted, I’m only supervising 2 children in my case and this has all come out of desperateness, hence my simple, focused approach. We have 1) a specific day on which we start, 2) I simply supervise. My 9 yo can handle stains just fine but my 7 yo needs me to supervise him on this step. 3) Simply follow through…set a timer if necessary. I have to check on the process as we go to make sure it is done well and any retraining can happen on the spot. 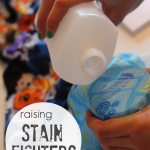 4) I expect my kids to help out with chores like this before they eat next meal or play. No reward is necessary. ANNA! Thanks for sharing–I think it sounds like you found a system that works for you! Great job!! 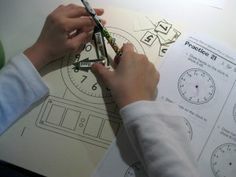 Other folks, when they change up plans suddenly or add more to a kid’s chore list need to rock it a little differently. Different ways to cross the same bridge! 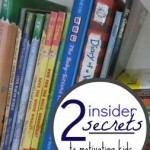 Thanks SO much for sharing your experience–I’m sure it will help other readers!! 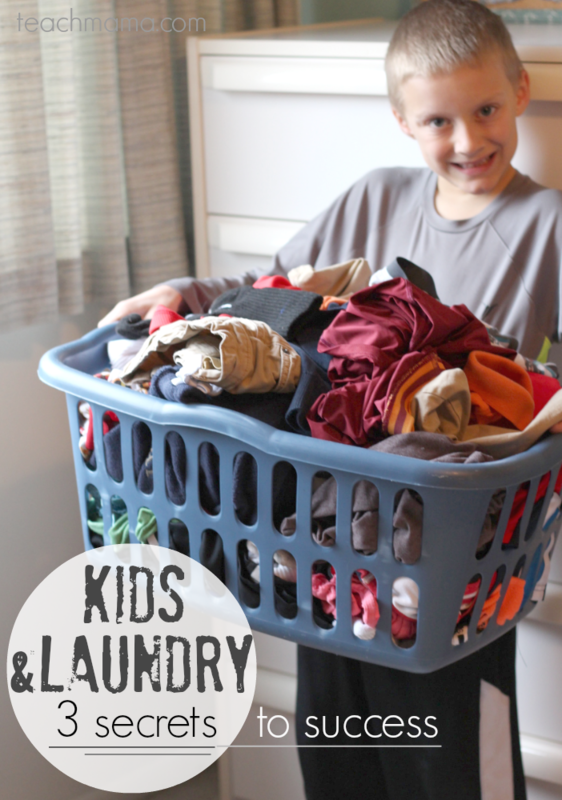 Three cheers to clean laundry–and kids who can help! !